If you want to visit Barcelona this month of November and you expected to take wonderful pictures of La Pedrera or Casa Mila standing across the street you will be quite disappointed. As you probably know Barcelona will be connected to France by AVE trains (AVE stands for Alta Velocidad which means High Speed and at the same time ave means bird). The line between Madrid and Barcelona is already operational while the works from the Catalan city on to the French border are underway after years of delay (expected to connect with the European high speed network in 2012). You probably know as well that recently they were very near Sagrada Familia with the tunneling machine and there was a debate on whether this would affect the Cathedral foundations or not. The fact is that the choice was finally made and Adif the company in charge had to built a protective wall to strengthen the area. 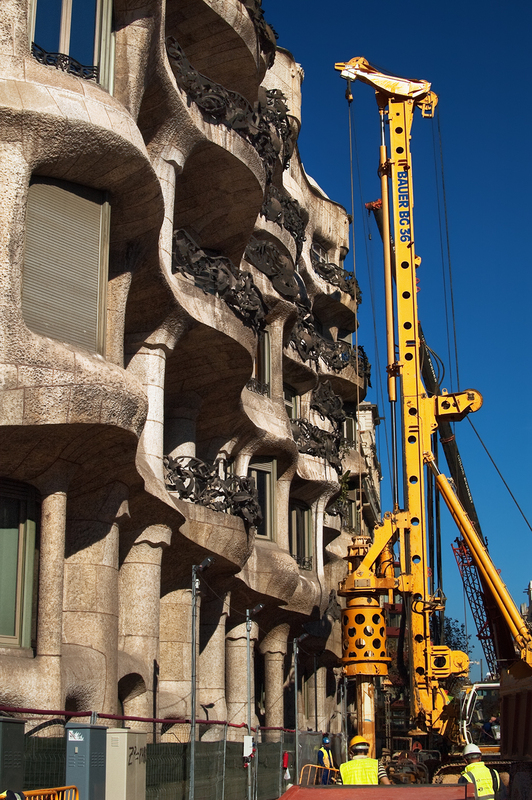 The same protection was recommended by a group of experts to be implemented right next to La Pedrera. As you can see in the image they are already drilling to make the 32 pillars which will create a smaller protective wall and it is expected that Barcino, the tunneling machine, arrives here in coming months. After watching the drill approach so ominously over the famous façade I can't help thinking somebody somewhere in some dark ministry office must have screwed it up badly when they let the speed train go along Mallorca and Provença streets (UNESCO gave the international approval) risking our cultural patrimony in the name of development and technology. What a beautiful shot Carlos. I was wondering while I was reading your post who allowed such a thing. In the name of progress? Thanks, great post. I totally agree with you. Wow! That's very interesting. I do like the high speed trains, for sure. The train we caught from Avignon to Barca was SLOW! But I hope everything proceeds without any damage. La Pedrera is magnificent that's for certain. I remember studying this building in architecture class, truly magnificent. The picture kind of portrays a clash between the past, present and future.